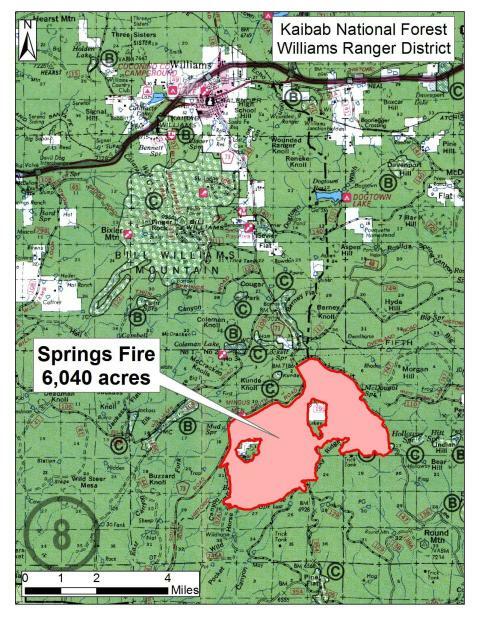 ST. GEORGE — The Springs Fire in Kaibab National Forest, Arizona, grew to 6,040 acres in size this week although cloud cover, increased humidity and monsoonal rains have slowed the fire that is moving south toward the Pine Flat area. Fire personnel planned measures Wednesday to provide water for wildlife in the area and to protect wooden fence lines. Cloud cover, increased humidity and monsoonal rains have slowed the fire and reduced smoke. 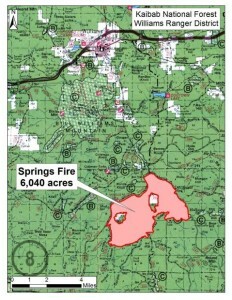 The Springs Fire was started by lightning and has been burning since July 2 in the Williams Ranger District of the Kaibab National Forest. It is located 9 miles southeast of Williams, near the intersection of County Road 73/Perkinsville Road, or the “South Road,” and Forest Road 354, near Davenport Knoll and Summit Mountain in Arizona. Fire managers continue to pursue a number of objectives, first and foremost, both the safety of the general public and firefighters on the ground. At the same time, fire managers are allowing natural fire to play its role in the ecosystem, enhancing wildlife habitat and improving forest health. There are currently 30 fire management personnel assigned to this fire incident under the command of Ryan Rawlinson. Wednesday, fire personnel took measures to ready wildlife water tanks, or trick tanks, near Forest Road 57A and Forest Road 746 for the fire’s anticipated spread. The trick tanks provide water for deer, elk and wild turkey in the area, and protection measures include digging firelines around them and removing tree limbs or flammable materials. Crews are also protecting wooden fence lines near Forest Road 129. Fire personnel completed preparations to forest heritage sites Tuesday, protecting them ahead of anticipated growth of the low-intensity wildfire near County Road 73 and Forest Road 57A. Burnout operations were also completed by fire crews along Forest Road 354 to assist in holding predefined perimeter roads. 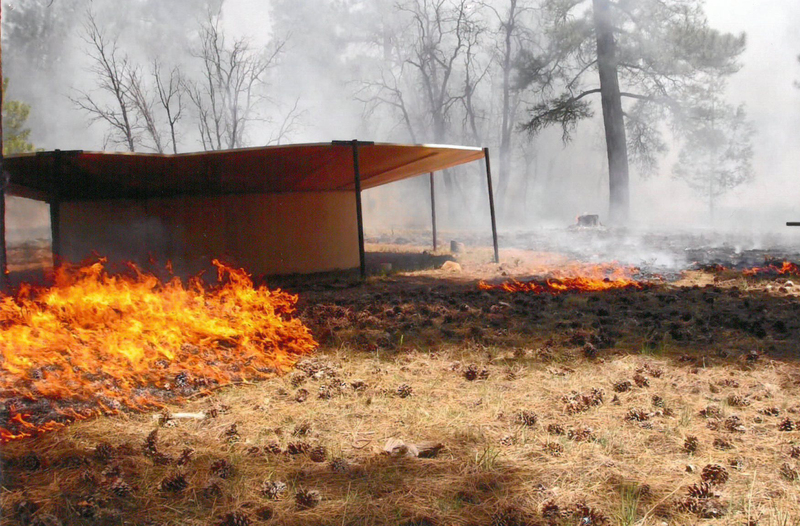 A trick tank located on the Tusayan Ranger District, Kaibab National Forest during a managed wildfire in 2008. 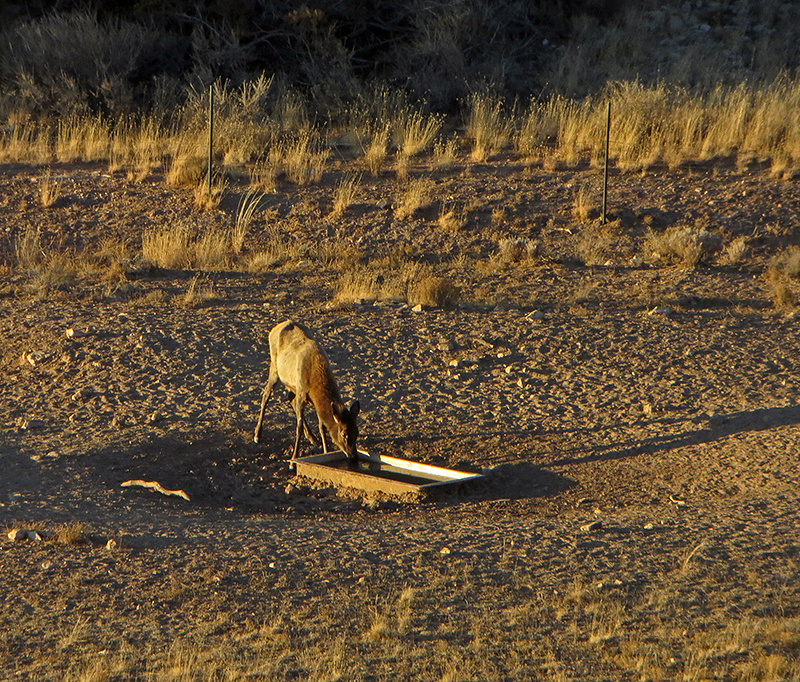 Nearly 40 trick tanks are located throughout the Kaibab to provide wildlife such as elk, deer and turkey water. (Credit of the U.S. Forest Service, Southwestern Region, Kaibab National Forest). Smoke impacts have lessened substantially due to cloud cover, increased relative humidity level and monsoon rain showers. Some smoke has drifted south towards the Wild Horse and Sycamore Canyon areas as the fire continues to move slowly southward towards Pine Flat. Monsoon weather over the weekend, which continued into this week, has helped to keep smoke impacts low. The Summit Mountain Trail (No. 68) will remain closed until Sept. 30, or until Closure Order 07-15-01-F is rescinded. The trail was closed July 30 due to the direct impact of the Springs Fire.